The largest portion (36 percent) of employers recently surveyed said that specific/technical skills related to the job were the most important. 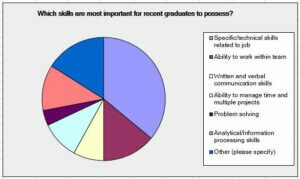 In the survey conducted among 100 human resources professionals in early April by global outplacement and coaching consultancy Challenger, Gray & Christmas, Inc., the employers also stated that soft skills like ability to work within a team and communication skills are also among the most important for graduates to possess. Ability to work in a team environment was selected by 14 percent of respondents. Surprisingly, having strong written/verbal communication skills was selected by just 8.0 percent or respondents, and problem solving was the most important skill for just 4.0 percent.